I found something super cool on my wanderings through the internet, and I end up (as I have noticed I often do) browsing through Design Sponge‘s DIY section. I came across something super special and awesome, but be forewarned, this is probably something that will take a little bit of time to put together, not to mention patience, but the end result is super impressive. Check out the full tutorial here. black rubberized fabric like a non-slip black drawer liner material from the hardware store, but a thin neoprene foam will work, as well, You can also probably use vinyl from a fabric store. Your first step is to use your box cutter and (carefully, so as not to remove phalanges), to remove the pages from the book, keeping the covers and the spine in tact. Lay your book, face down, on top of your black fabric and trace the dimensions, and use your box cutter and a ruler to cut a rectangle 1/8″ smaller on all sides than the traced dimensions. Next, take your elastic and cut it into both short strips (the width of your book cover) and long strips (the height of the cover), and cut enough of them to fill the book cover when laid side to side. If your strips don’t match up exactly, opt for one less and space them out slightly. Starting in the upper left corner of the black cut fabric, pin your long strips in a row and sew them down along the edge. Don’t secure the bottom yet, and don’t forget to remove the pins. You do not want a symmetrical weave, as the more space you leave, the bigger the accessory that you can store. Keeping places where you leave 2 or 3 elastics exposed is a good thing.You can choose how big or small you want your spaces to be, and you may want to keep some accessories handy so you can test it out. When all the short strips are pinned in place, and you’re happy with how it looks, sew around all of the other unsewn edges to secure them in place and trim any excess from around the edges. Cut your illustration/mat board to the inner dimension of the front book cover. Use your sewing machine or an awl to poke holes around all four edges of the board. You can hand crank the sewing machine, which allows you to space the holes out a bit more. Use a needle and thread to sew the board to the backside of the black fabric – behind the side of the elastic grid.You can do this easily and securely using a blanket stitch. Just make sure to pull each edge tight, since you’re sewing to stretch the fabric and tighten the grid. Once your board is sewn to the backside of the grid and the grid is pulled tight, cover the three edges with black photo tape (or you can sew or glue on fabric tape if you prefer). On the right-hand side of the fabric rectangle (the side that will cover the inside of the back book cover), use your knife to cut a 3.5″ horizontal slit for the pocket 1″ from the edges (not including the width of the spine) and 4.5″ up from the bottom edge. You can also cut 2 horizontal slits at 4 inches above the pocket and instert a thick band of fabric so that a phone can be held in place. You can really add whatever you’d like, and if you really like the elastic grid, you can do a second one of those too. You’re now ready to add your lining to the book cover. You can use craft glue on the side with the paper board, but be sure to use glue that is good for fabric on the side with just the fabric backing. Add your glue (make sure to get to the edges), and press into place. Make sure to line up the edges evenly and press down firmly. Clean any glue mishaps, and lay the book open on the floor, cover it with a sheet of clean scrap paper and then put something heavy on top so that everything will dry flat. Let everything dry overnight. If you want to add any latches or elastics over buttons to help to keep this closed, you can do that. Or you can leave it just like a book. I think that this is such a fabulous tutorial for such a unique gift. Love it so much. Yeah. I’m still in its grasp, and if you’re a Pokemon fan I imagine you are too. Like me you’ve also likely noticed the drain it can bring to your phone’s battery. Well, one pokefan has come up with a design that with a bit of electrical work and access to a 3D printer. That’s right, it’s a custom case with built in charger that looks like the original pokedex. 😀 Designed by Spark Fun user npoole this case is pretty simple and super sharp to carry around. They have a nice set of instructions so you can make it yourself (with estimated cost around $40) though it is sadly only available for the Samsung Galaxy S4 and iPhone 6. If you are decent at computer modeling, or know someone who is, you may be able to tweak the design and make one to fit your phone as well. Now if only the servers would stay reliable…. Made by youtuber Shadowman (of working K’nex Skeeball fame) this massive machine is a work of art and engineering. It took years to build and according to the builder features ‘more than 45 new elements, 5 different lifts, and 2 new path separators that separate into 17 paths. It’s also themed, with Knex men all over the place working on it, giving it a factory-type feel with catwalks and stairs. There are 3 total motors, one of which powers all 3 floor lifts’. My build level for these has always just been follow the instructions like the lame-o I am, so this sort of creativity is always a bit like witchcraft to me. The video of it in operation is definitely worth the 15 odd minutes of your time. While not the most practical thing to type on any more, classic typewriter definitly had a certain style and visual appeal that you just don’t get with today’s slimmer and minimalistic design. 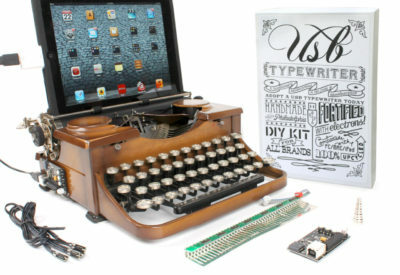 Don’t let that beauty rot though, cause Jack Zylkin of usbtyperwriter has got you covered. 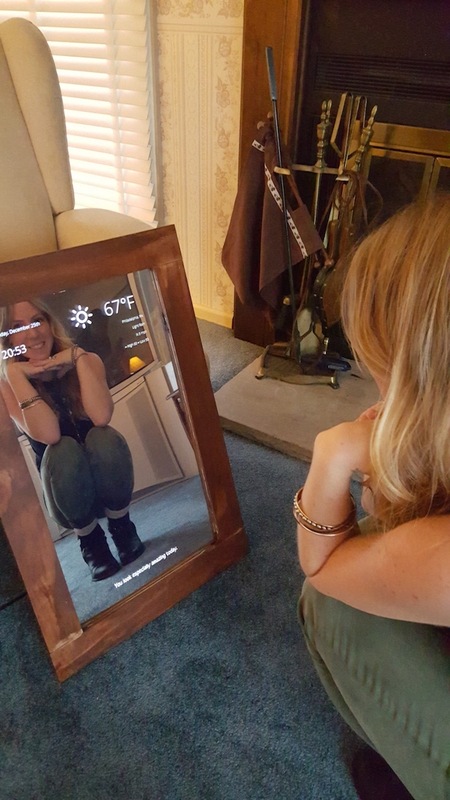 Ever heard the Snow White fairy tale and gone, “Wish I had a mirror that would tell me stuff.” Well one guy decided to make his own. The base version he designed is simply a monitor with a mostly black background behind a double sided mirror so it can display simple things like the time, weather and an uplifting message. 🙂 It’s still incredibly cool and actually not too hard to put together if you’re comfortable with woodworking and electronics. 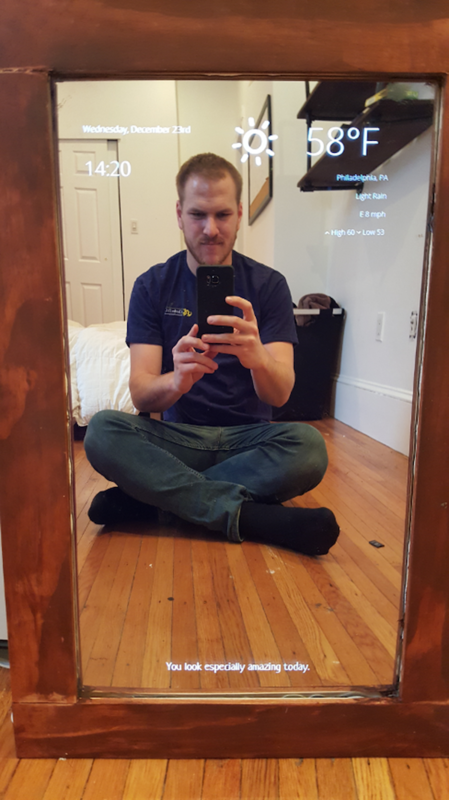 The guy, Dylan Pierce, has a step by step guide online so you can make your own including the source code you’ll need to program your magic mirror with! If you still feel overwhelmed during the process he also setup a handy forum where you can ask more knowledgeable people about the process for help. 🙂 One post is even entitled a step by step for dummies for can’t make it work. Maybe not the nicest but as someone who only knows a bit about code, that’s the type of stuff I know I’d need, lol.